Select New metric > Create a team poll. Enter a name and description which will appear on the poll metric's detail page. 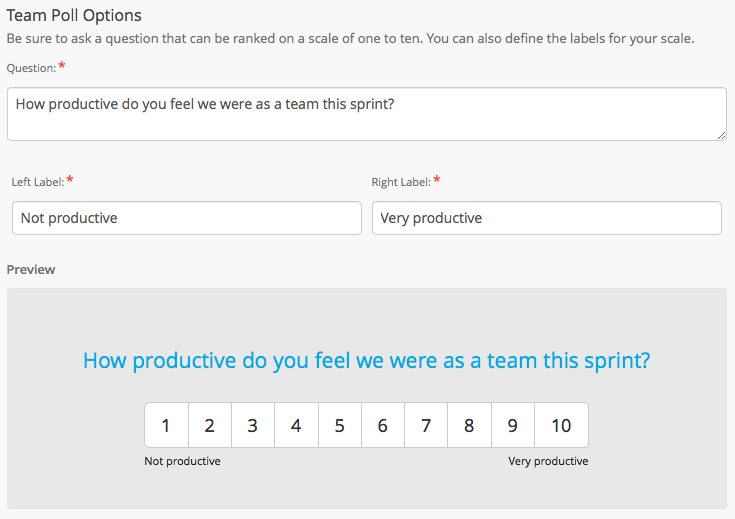 Polls allow users to respond to a question on a scale of 1 to 10. Enter the question you want to ask and assign a value to the labels on the scale. Your changes will display in the preview. Select the users you want to respond to the poll from the drop-down menu. Enter the email addresses of anyone who is not yet a Jama Analyze user. They will receive an email inviting them to respond and to join your Analyze account. Select how you want the metric to display the data, and enter the values for how often you want to remind participants to respond to the poll. Select Unlisted if you want to hide this metric from others. Select Submit to create the metric.